The IBM R&D centre in its Mount Carmel setting in Denia, Haifa. 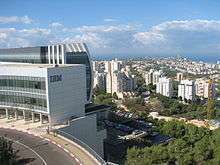 IBM Haifa Research Laboratory is located in Haifa, Israel. It is one of several IBM R&D Labs in Israel. IBM Haifa Research Laboratory (HRL) handles projects in the spheres of cloud computing, healthcare and life sciences, verification technologies, multimedia, event processing, information retrieval, programming environments, business transformation, and optimization technologies. HRL is the biggest IBM research center outside the US. Established back in 1972 as the IBM Israel Scientific Center, the IBM Haifa Research Lab has grown from three researchers to over five hundred employees, including regular staff members and many students. The IBM Haifa Research Lab is located in a custom-built complex adjacent to the Haifa University campus, with branches in Haifa and Tel Aviv. Current projects include healthcare, cloud computing, formal and simulation-based verification technologies, programming environments, chip design, storage systems, information retrieval, collaboration, and much more. At the IBM Haifa Research Lab, twenty-five percent of the technical staff have doctoral degrees in computer science, electrical engineering, mathematics, or related fields. Employees are actively involved in teaching at Israeli higher education institutions such as the Technion (Israel Institute of Technology) and supervising post-graduate theses. Many employees have received IBM awards for achievements and excellence.